Now that engagement season is upon us, I wanted to share some fresh and creative ideas for how your significant other can pop the question. Engagement season was so named because of the increase of the number of engagements that takes place from Thanksgiving through Valentine’s Day. Believe it or not men, armed with this information, wait for these popular calendar dates to come around to ask for a woman’s hand in marriage, specifically among the gatherings held by her family and friends. For those that get engaged during this season it is now well known to be one of the most joyous and memorable days of the beginning of a couple’s lives together. All the more reason to put some extra thought and effort into how you’ll propose. Thinking outside the box is a welcome gesture as this will be the most asked question she will receive during your engagement. She will tell her proposal story time and time again from the day she says yes right up to her wedding day. So let’s make it a great story, one she will be beaming with pride and excitement to tell. Here are 7 creative suggestions to help get you started. 1. 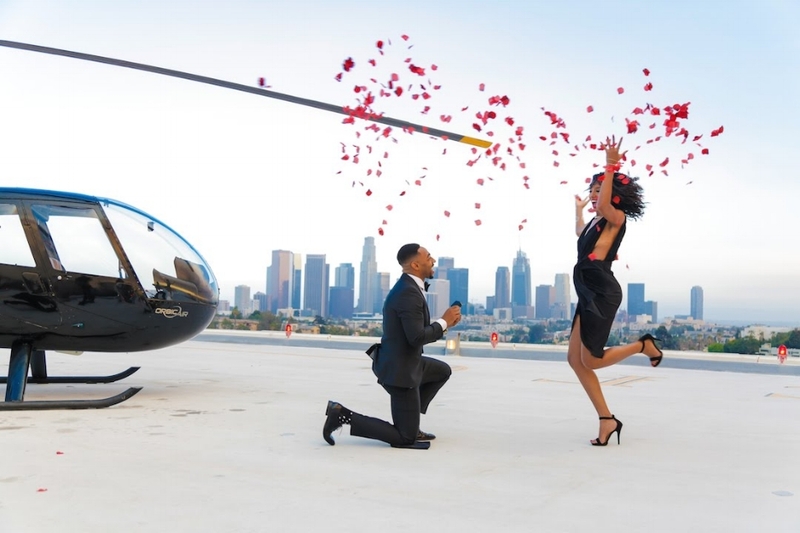 Rent a helicopter under the hoax that you’re taking her on a special romantic date with the icing on the cake being showing her the city from the best view possible. Unbeknownst to her, the real celebration begins after you de-board your flight and get on one knee with ring in hand. Tip: It may be a good idea to find out if she has a history of motion sickness before reserving your chopper. You don’t want a disheveled, nauseous, dizzy bride to be looking like she’s going to keel over at any moment. Not exactly what picturesque moments are made of. 2. For a really romantic proposal, why not recreate your first date, but in a more scenic setting. Maybe you met and had your first date at Starbucks. So for your big announcement take your significant other to a Starbucks location that will blow her mind, like this rooftop Starbucks in Bebek, Turkey. If a trip to Turkey is outside your budget then choose a location that will be memorable. Tip: Ask the store manager to assist you with your big surprise. I’m sure they’ll be more than happy to accommodate you to make it ever so special. 3. Take her to the movies, but rent out the movie theater for about 1/2 hour and during the commercials have the theater play a short film of your love story. Family and friends can sneak in while the lights are low and spread themselves throughout the theatre and you can also hire extras to make it more believable. Then once the ads start playing and your short film ends you can make your intentions known to your beloved. (Click here to find out the estimated Tip: Hire a professional videographer to create the short film, after all this video will be one of those things you’ll watch over and over again for years to come. Click on the link here to see how a young Bahamian man from our Munaluchi Couple’s “Harlem Renaissance” MunaSerenade 2018 proposed to his beloved girlfriend. She was blown away to say the least. (Picture below is a hint of where he proposed) So put your best foot forward gentlemen because creativity is key! 4. During the holiday season, an adventure to find a Christmas tree can turn into the perfect spot for her to come upon the words, “will you marry me” hung from a pre-selected and decorated Fraser fir or Balsam fir Christmas tree. 5. Ahh France, the city well known for it’s food, fashion, rich history and of course romance. So why not fly your love to France and turn your proposal into a classic picture perfect moment. Your fiancé-to-be won’t ever forget the entire romantic experience of where she got engaged. And if you’re anything like me the wheels in your head will immediately start turning thinking about how to top his engagement surprise location. 6. Ready for a road trip, then why not choose one of the popular tourists attractions around the U.S, like The Grand Canyon in Arizona/Nevada, Niagra Falls in Canada/USA, Hoover Dam in Arizona/Nevada, Empire State building in New York, Las Vegas Strip in Las Vegas, Golden Gate Bridge in San Francisco, or Bourbon St. in New Orleans. You choose your favorite place that’ll add the right amount of romance and adventure to your proposal. Tip: The Grand Canyon at dusk is one of those must see experiences of a lifetime and it might be the perfect setting for your betrothal. 7. Keeping it local can include taking her to the most romantic restaurant you can find. (Checking online reviews or getting a close friend or relative’s recommendation can help here). Restaurant staff love it when their customers are celebrating a special occasion. They go above and beyond to make it perfect for all involved. At the time of your reservation make all the surprise arrangements with the staff. Depending on your plan, find out what is and isn’t permissible at the establishment. Tip: Beforehand arrange for your waiter to place the engagement ring at the bottom of her champagne glass, and while you are both gazing into each other’s eyes and in deep conversation, the waiter will hand her the glass and as she discovers your secret and becomes giddy with excitement, you get down on one knee to propose. (FYI- This is exactly how my husband proposed😉). Whatever you decide make it fun, exciting and most of all memorable. Happy Wedding Planning!